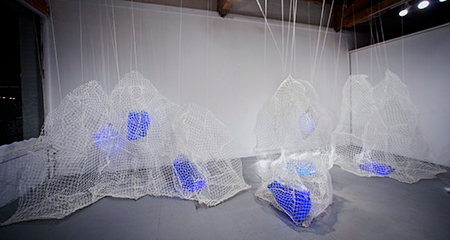 Rachel Mica Weiss, Engulfing the Elusory, (installation view), 2013. 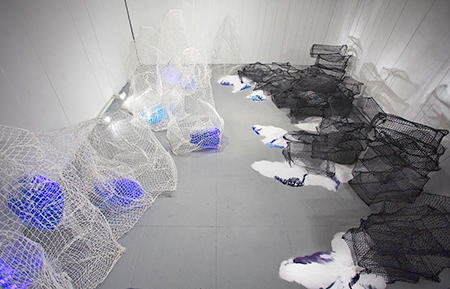 Industrial nylon net, paint, epoxy, wire, string, plastic bladders, water, dye, LEDs, salt, dry pigment. Installation space: 11′ x 18′ x 22′. To be blunt: It’s been quite difficult to write about Rachel Mica Weiss. 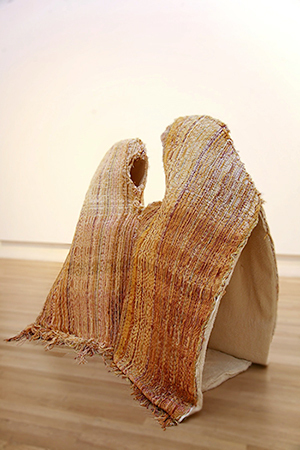 Her seemingly simple artwork of woven fibers, heavy rocks, and large tapestries of knots deliver moments of considered contemplation. For me, that contemplation reduces my chances of finding something to write about. It’s like taking a really wonderful bubble bath, and then realizing that you’ve just been soaking in all your grimy dirt, so you have to get up and take a shower. With Rachel’s artwork, I enjoy my purposeful visual wandering around the surfaces of her objects and the physical game of hide-and-seek with other viewers around her stationary large sculptures. After an experience with her artwork, the last thing I want to do is sit down and write about it. 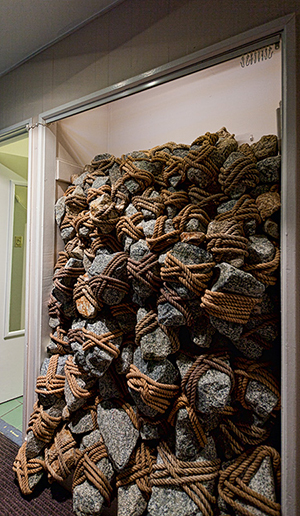 Last month, I attended the opening reception of Rachel’s newest work of art at the San Francisco Arts Commission Galleries Window Site — a site-specific sculptural installation titled Engulfing the Elusory. That same night just down the block, Swedish House Mafia was playing a giant electronic dance music concert. As perplexed and hypnotized as I was by the intricacies of Rachel’s artwork, I was happy to be distracted during the opening reception by all the cool raver kids in neon shirts walking around outside. What a coincidence for us, as Rachel was always such a good instigator of a late night living room dance party back in our grad school days. Now that she’s picked up and moved to Brooklyn, it’s so exciting to have her exhibit in San Francisco for a few months. Jeff: I visited your website, and I noticed that there were already plenty of hyperlinks to different press media in the area. Did you know you were going to get all that press? Rachel: No, not at all. J: Would you consider this your first solo show? R: Yeah, I would, but it takes a really weird format in that it’s a window show. The viewer can’t enter the space or move around the three-dimensional objects. J: Did Meg [Shiffler, Gallery Director for the SFAC] tell you that there was going to be press? R: I knew about the San Francisco Chronicle article because Pat Yollin and I did an interview before it was published. But I didn’t know that the show would be mentioned in 7×7 or the San Francisco Bay Guardian. J: Those are great publications — really popular. Did they interview you, too? R: Well I think the SFAC press release that went out in mid-December of 2012 got people really excited about it. 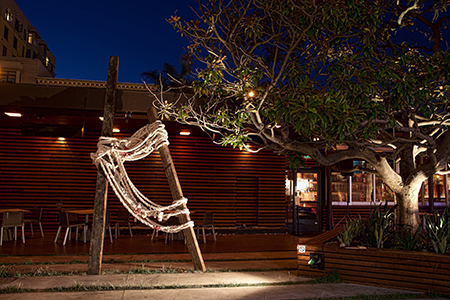 7×7′s article mentioned the event as one of five big openings to attend and the Bay Guardian just kind of wrote a review — it was in their “Best Picks” section. They looked a little bit at my website too and wrote about my past work. J: On a scale of 1 to 10, 10 being the hardest, how hard or easy is it for you to write about your own work? Because I have to say — writing about your work ain’t easy! R: Ugh, uhm… Probably right in the middle. It gets easier as pieces get older and I’ve talked about them more, but I had a really hard time writing about this work because I was taking risks I hadn’t taken before and using processes that were new to me. While I have been working with fibers and textiles for a while, this was my first time using industrial nylon net, which I made into rigid panels by coating it in marine-grade epoxy — also new to me. I had to do this in such large quantities that I loaded it out the window of my Bed-Stuy apartment to work in the brownstone’s backyard. I also carted a load to D.C. to work in my father’s garage — you make things work. Since everything was constructed in batches and pieces and had to be shipped, I never saw the installation as a whole until it was finally all together the night before the opening. So it really wasn’t until then that I knew what it really was. J: Whoa, that’s crazy to think about writing about your own work before it’s actually completed, but I guess artists have to do it all the time. And to make things worse, you’re writing about the work for a press release that is informing the news media, and then they are basically promoting the work that doesn’t exist yet! R: Yup. But I also think that that’s the way things go at this stage. J: What do you mean by that? This stage, like, as an emerging artist? 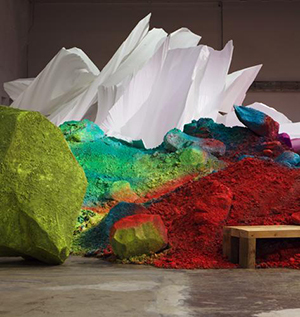 Rachel Mica Weiss, Engulfing the Elusory, (detail), 2013. 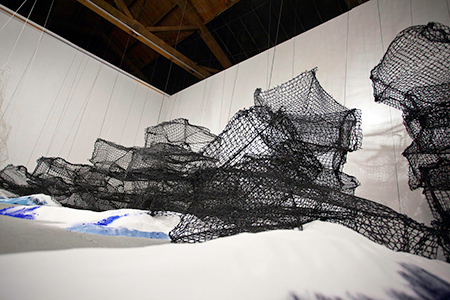 Industrial nylon net, paint, epoxy, wire, string, salt, dry pigment. Dimensions variable. R: Maybe. The SFAC is an organization with a citywide presence and the press takes an interest in the shows it produces. I think that showing at venues like these means that having something published before the project is complete becomes more and more important. I’m not trying to compare myself to someone famous or anything, but take Ann Hamilton for example: she had a huge performance installation at the Armory this fall and banners were made to hang around New York City long before the project went up. I would have to imagine that the details were not all finalized when those banners went to print. J: Speaking of Ann Hamilton, she’s obviously got to be a huge influence for your work. R: I’m definitely inspired by her “antique aesthetic” and the way she deals with how politically charged textiles are. I was looking at a lot of her work while making the big rope installation, Torqued Ellipse (After Richard Serra), but I’m kind over that whole thing. For the SFAC installation, I really wanted to change things up. The new work was definitely inspired by Katharina Gross’ huge MassMOCA installation from 2010, One Floor Up More Highly. I’d love to work as large as both of them one day. J: Can you share some ideas that were present from the start of the project and then some that emerged post-press release? R: I guess this project, like a lot of my work, started with the idea of self-containment. I’m thinking about the ways in which we place limitations on ourselves. R: Sure. This project in particular kind of took on a more global or geologic perspective. It was definitely informed by human practices around climate change, but in a more general way, it’s talking about our attempts to contain that which doesn’t want to be contained. These crates — or what should I call them — these box forms are trying to hold on to pounds and pounds of salt, but it’s a ridiculous task because it’s pouring out of the net. It’s futile. I guess the other side of the installation deals with the opposite extreme: trying to hold on to something so tight that you lose access to it, like the plastic bladders of water that are wrapped in net, and then wrapped in another layer of net — it’s this precious resource nobody can even get to. J: Just like the space — no one can get inside. R: Yeah, I think that’s sort of a cool thing about it. J: That I can’t go inside? R: Well, that the installation is all about limitations and barriers with its human-sized net “cages” and that the whole viewing experience makes you very aware of the fact that there is the barrier of the window right in front of you. A lot of my past work dealt with that — restricting viewers from moving around the work and making them very self-aware. So I kind of think it’s cool that the structure of the show does that for me. J: Once you did get into the space to install the work, what new ideas started to emerge? Like, what were some things that you could have included in the press release if this weird statement-deadline-before-art-is-completed-issue wasn’t an issue? R: There were a lot of surprises. I had totally misremembered how the ceilings were. R: Well, you have to be prepared for unknowns, and I was. 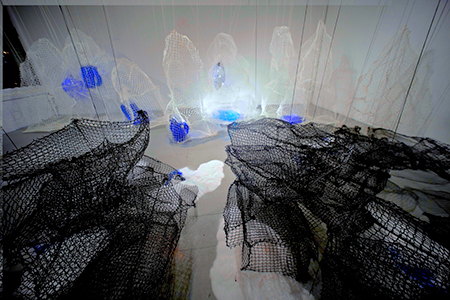 But, I had to hang each of the elements individually with string, and so the strings became a major part of the piece. J: Whoa! I thought that was such a signature Rachel Mica Weiss moment — funny how that happens. R: The shadows also became really interesting. I adjusted the lighting to try to amplify them. Usually I find intense shadows to be kind of gimmicky, but I felt like they really worked in this space because the shadows made it seem like the net was taking over the room and climbing up the walls. J: So a lot of surprises regarding technical specifications. Were there any surprises regarding concept or theory or philosophy? Did you discover the meaning of life? R: Well, I think that the addition of the strings added this layer of precariousness to the whole installation, this sense that everything in the room was sort of artificially held in place and could come crashing down at any moment. During the public conversation about the work, someone commented that they were really anxiety-inducing, so I guess I viewed that as a plus. Hurricane Sandy also happened while I was in the process of making everything back in Brooklyn and so that added a new dimension to the concepts around self-entrapment and vulnerability. J: With a project that big, I gotta ask: did you have any help? R: Ha, my God, yes. I really have to give a shout out to my fiancé, Taylor, who is a tireless studio companion. R: He actually made half of the black forms. And then when I was in San Francisco installing, Pete Hickok, Josh Band, and Evan Adams — who makes awesome music by the way — all helped out and I couldn’t have done it without them. J: That was a beautiful Oscar acceptance speech. J: What was it like to work between New York and San Francisco? R: It really defined what I made. In the past, I’d been working with really huge, heavy material but I knew I had to fill this 400 sq. ft. space and had to be able to ship the work. I had to think from the beginning about working with something light and airy. J: Exactly the opposite of a lot of the work I’ve seen you make when you lived in San Francisco. R: I couldn’t be pushing around shopping carts full of granite rocks. But I still love working with heavy material. Once I landed in San Francisco for my install, I was able to pick up 500 pounds of salt at Costco and fill up the water bladders which I had custom-made in Australia, so I got my heavy fix. 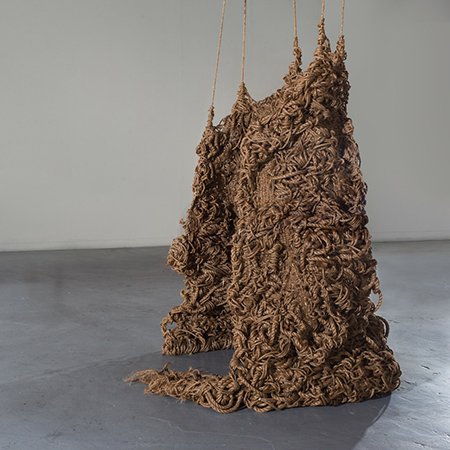 Rachel Mica Weiss, Cloak Somewhat Soiled, (closet installation), 2012. 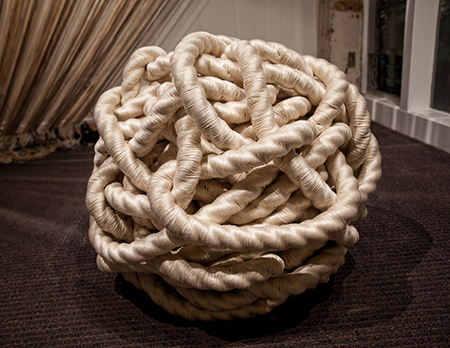 Granite, cotton rope, soil. 76″ x 50″ x 30″. Rachel Mica Weiss, Cloak Somewhat Soiled, (closet installation), 2012. Granite, cotton rope, soil. 76″ x 50″ x 30″. J: How did you get chosen to show at SFAC in the first place? 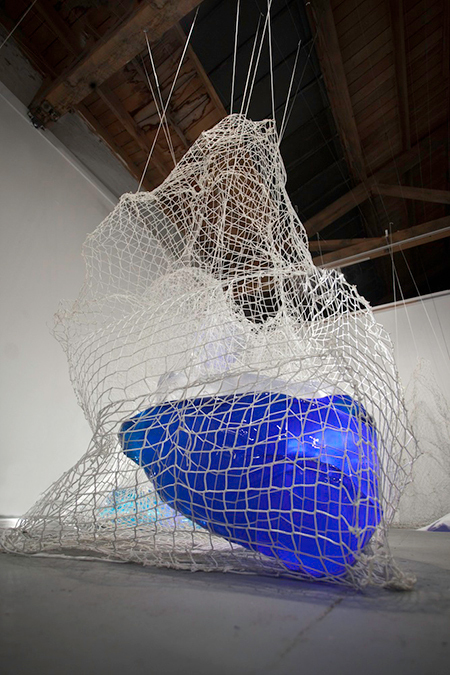 R: Meg saw this huge rope/cave/sculpture I made for the Murphy and Cadogan Fellowship show in 2011. 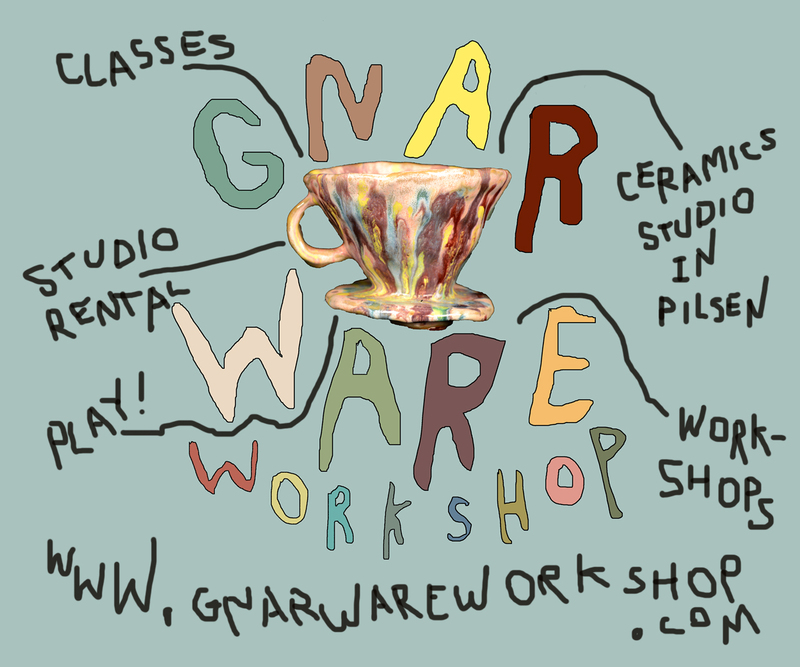 So when she saw that piece, she thought that something thematically similar would work well in the window site. J: Oh right, I was not nominated for that fellowship, so thanks for bringing that up. R: Oh, sorry Jeffrey. People fly you around the country to hear you talk though, so that’s something. R: This show coincides with the last show in the SFAC’s main gallery space before the Veteran’s Building undergoes a huge renovation. I thought it would be appropriate to keep working with ideas around loss and transition. J: Because you’re my friend, I know I can say this to you: when I hear about an artist working with “loss, and transition,” I get really sad and I want to know how bad their childhood was. R: [laughing]. Um, if you want me to say my childhood was bad, I can say that, but it was actually really good, though I did grow up in two homes. J: Damn it, I thought I knew everything. But really, those are some intense concepts! 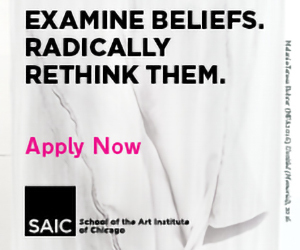 Do you think your audiences read those broad ideas? R: I guess I don’t usually talk about my work in such broad brush strokes but the piece does deal with that transition between two states — the gallery is literally divided into two camps — and I think that the black crates, emptying their salt onto the floor definitely address loss in a broad way. I guess the work is really about so many intertwined concepts. J: That’s the curse of media, right? In a way, one wants to be written about, but there’s so little information in text when it’s supplementing a visual work of art. R: What I strive for is for a piece to have multiple resonances with the audience. Those themes happen to be the general themes that underlie the past three years of my artwork, but a lot of different bodies of work were made during that time period. They all have specific complexities. J: No pun intended but do you see any specific string that ties everything together? J: Do you have a signature thing you like to work with? R: Oh, totally. I’d say that most of my work involves fibers of some kind, or it uses or refers to a textile process. J: Do you make scarves? R: Yes, but generally not. J: Have you heard of Etsy? R: Yeah, that’s not really my jam. Even though I started getting into textiles through weaving, I’m probably a horrible weaver. My work now just kinda messes with that process — interrupts it somehow. J: Okay, and the cohesive string in terms of themes. Are restriction and emptiness everywhere in the Rachel Mica Weiss oeuvre? 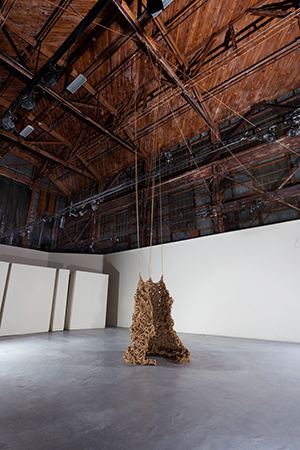 Rachel Mica Weiss exhibits her artwork, Engulfing the Elusory, at the San Francisco Arts Commission’s Gallery at 155 Grove Street through April 27, viewable 24/7. You can view her other artworks at www.rachelmicaweiss.com.